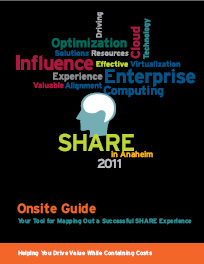 It was a great time of year to be in Anaheim, California last week for the IBM System z Mainframe SHARE user conference. The rains had just passed through and the weather was balmy. The Anaheim convention center is right next door to Disneyland, a place that was paradise to me growing up in Southern California. The juxtaposition was not lost on anyone – Mainframes being the really serious computing platform, and Disneyland being the silliest and most fun place on planet Earth. But there was fun at the SHARE conference, too. The death of the Mainframe has been predicted for years, but it keeps chugging along as one of the workhorses of large organizations. IBM has invested a lot in the hardware technology to keep it up to date, and you get a lot of bang for the buck with one of these systems. You can now even run Linux under z/VM and there are some really big installations of Linux on this platform. All in all, it’s an impressive system. I was at SHARE to support our partner, Software Diversified Services as they are now our distributor for PGP on the Mainframe z/OS platform. They are doing a great job of bringing this important encryption technology to IBM’s largest server system. People are often amazed at what you can do with PGP on the Mainframe. Create an Apple Mac self-decrypting archive on z/OS??? You have to be kidding, right? Nope, the PGP solution on the Mainframe creates self-decrypting archives for Windows, Mac, Linux, and flavors of UNIX. Also, it integrates with PGP Universal key server for key management. Another feature is that it compresses data up to 98 percent for encrypted data files. Additionally, it supports Mainframe file systems like PDS, Sequential, and VSAM. So PGP is an impressive offering for Mainframe customers who need to encrypt data for compliance. It was great to talk to the Mainframe customers who were approaching PGP with some trepidation. They were a lot more comfortable knowing that they could run PGP using normal JCL scripts. With the customer base holding steady at between 6,000 and 7,000 customers worldwide, and with IBM continuing to improve the platform and make it more affordable, I believe it will be an important computing platform for years to come. We’ll be seeing a lot more of Mainframes and Mickey Mouse for years to come. Click here for a free evaluation version of PGP for the Mainframe.